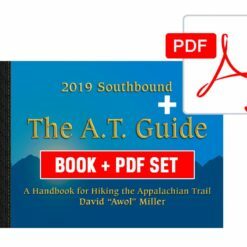 The 2018 A.T. Guide preorders have begun. Now through Christmas, you can pre-order this “must have” guide and receive a 15% discount. 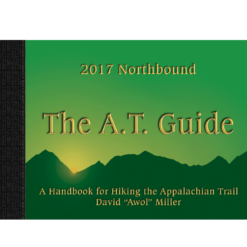 The northbound edition of the guidebook is expected to ship early in January 2018. The southbound edition will ship later that month. There will be bound and loose leaf editions of both books. The 2018 edition of The A.T. Guide has the same format and features that have made it the most popular guidebook ever used on the Appalachian Trail. It features an elevation profile of the entire trail, uniquely presented such that all landmarks align with the profile. Roughly half of the pages in the book are devoted to trail data, and about half covers what services are available in trail towns. The material is kept in sync, so town information is usually only a page turn away from the related trail data. Dozens of businesses have been added and hundreds of businesses have provided important new details about prices and policies. There are over 90 maps of towns near the trail and of areas where a small map best communicates how to navigate an area. This entry was posted in Season Pre-Orders. Bookmark the permalink.